Annual Gull Fest on Appledore underway! From left: Mary Everett, Alisa Povenmire, and Jamie Zananiri, all of Northern Essex Community College. This week I am on my annual idyll, banding gulls on Appledore. We have an excellent team this year (and I don’t say that every time. Or if I do, I do not mean it). It’s a mixed group of students in terms of their institutions of origin, four of them being my recruits from Northern Essex Community College. They, of course, are the best of the best. 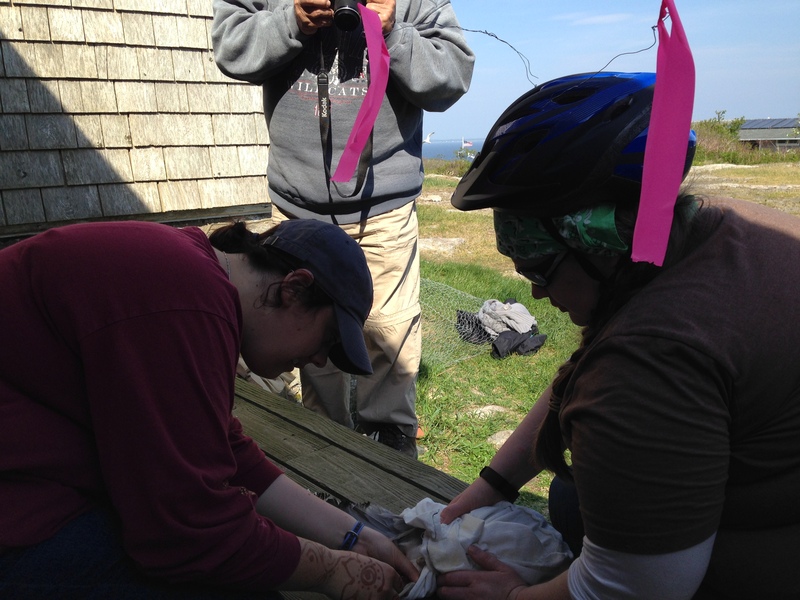 Jamie and University of New England student Taylor Ouelette draw blood from a Herring Gull. We are focusing mainly on Herring Gulls, which are notoriously difficult to trap, but the team’s spirits are high despite it all. We’re working long days, but I did want to let you know what’s happening before I stagger off to bed. Tomorrow, it’s another day of banding and patrolling the island for any previously banded birds. So far, we’ve banded around twenty birds, and we hope to at least double that by the end of the week. Wish us luck! 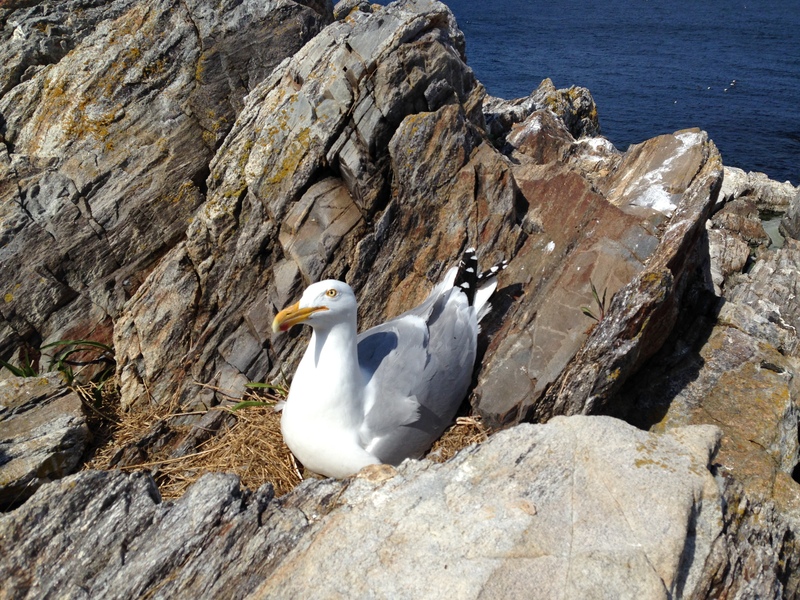 A single Herring Gull in the heart of Black-backed territory–intrepid. Cool, huh? 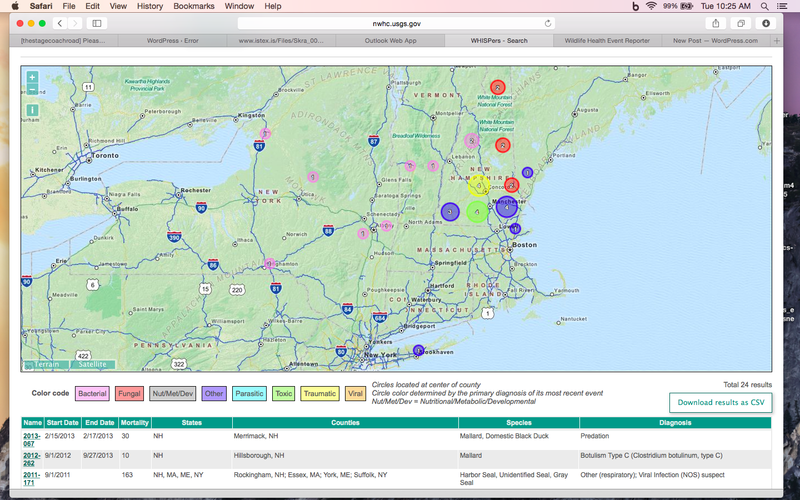 One gets not only geographic information, but in many cases, a confirmed or suspected diagnosis. Take a look around the site when you have a chance. Now, I abruptly turn to some happenings here in the northern SEANET reaches over the next couple weeks. 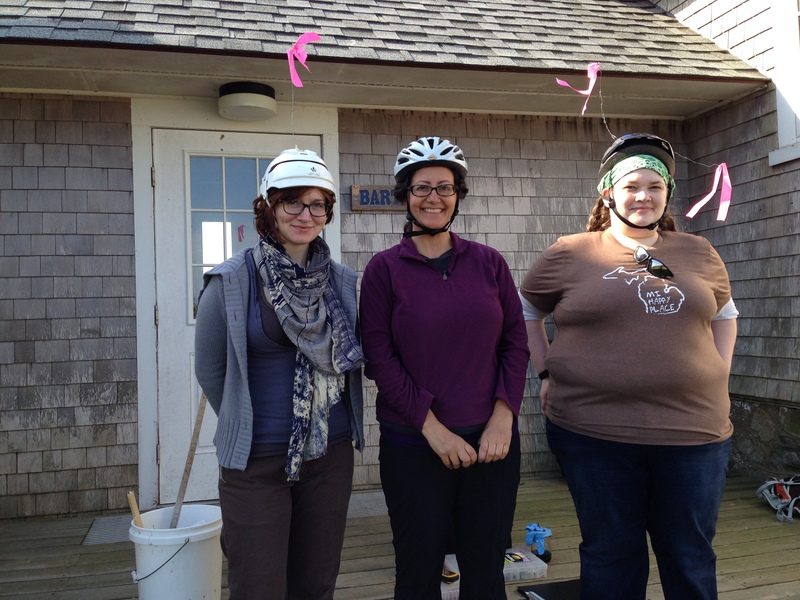 First up is our annual pilgrimage to Appledore Island to band gulls for the ongoing work of our own Julie Ellis. Through the generosity of a private donor, I was able to select four worthy students from my institution, Northern Essex Community College, to join our Gull Team this May. They are packing their bags and borrowing binoculars in preparation for the trip, and truly, none of them have any idea what they’re getting into. Thank you for your patience and forbearance during my teaching semester. Now, I am finished grading, and as a kickoff to the summer, I attended a 3 day workshop on forest stewardship here in New Hampshire. In addition to opening my eyes to a whole new way of seeing my environment, we were also introduced to the The Stewardship Network, a clearinghouse of volunteer and citizen science opportunities here in New England. If you’re in the area, and SEANET just isn’t enough citsci for you, I urge to check out the offerings on their site. I know I will be signing up for some of these programs and work days for sure. These activities already had me enthused to jump back into SEANET with both feet, and to top it all off, I received a request this week for a work up of our data from the winter of 2012-2013; you may remember that alcids were hit particularly hard that season, and I am contributing your data to a manuscript on the subject. 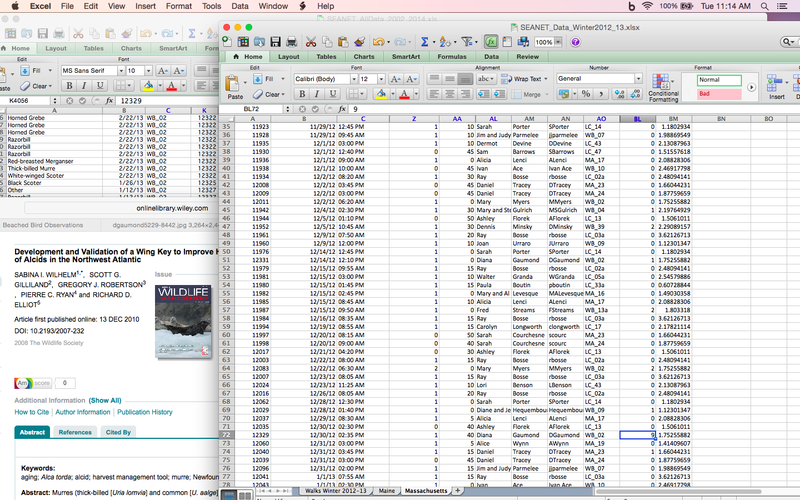 It’s a good thing I have enthusiasm for the project, because I certainly lack expertise in Excel, so the going is not swift, but it is steady. After that data is wrapped up and shipped off, it’s back to the mill for the backlog of regular old baseline data you all are diligently collecting. So thank you for bearing with me, and I hope you’ll stick around here to see what we get up to this summer! Now, for the final installment of this latest DBQ. 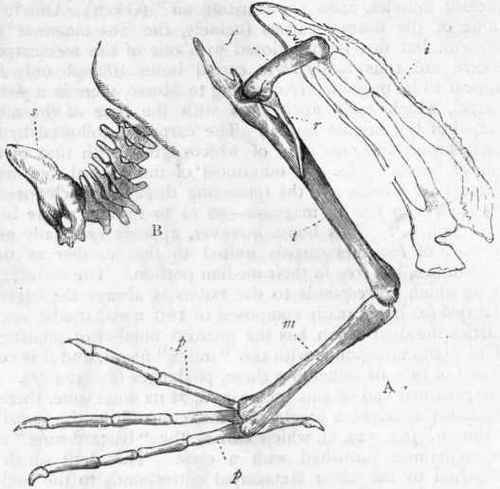 Bird C was nothing more than a leg, mostly stripped of its flesh. Remember it? 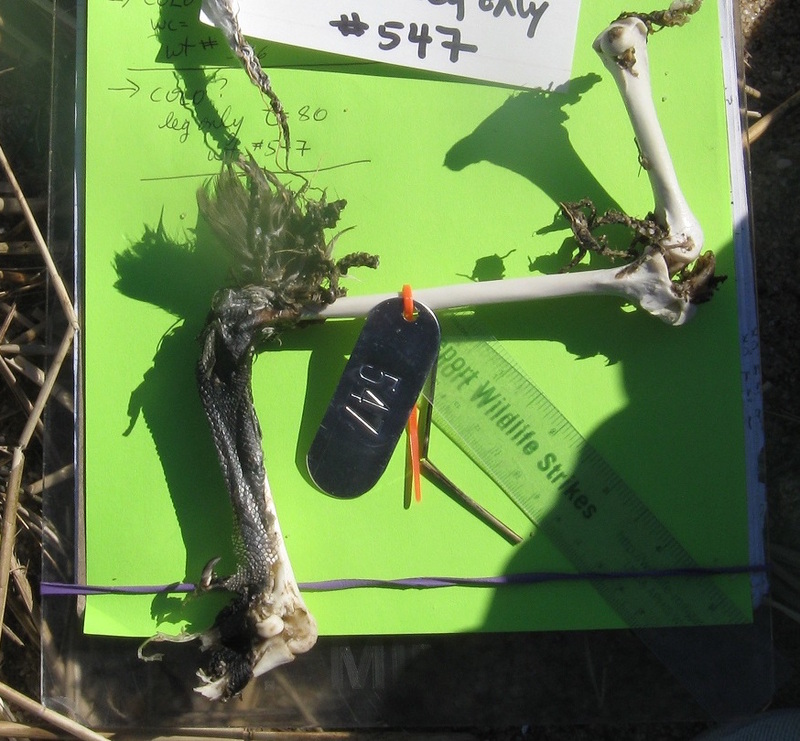 Bird C: Severed, skeletal leg found by Dennis Minsky on Cape Cod. What we can see here is that the skin that is left on the lower leg is black, and there is one small hind toe with a fairly small nail visible. The bones we see here, from the top, are the femur, which meets the tibiotarsus at the knee joint, the tibiotarsus, bearing the tag and the tie, then the hock (ankle) joint, and finally, the tarsometatarsus, which has the black skin on it. For our crack team of dead bird experts, this specimen was not particularly difficult, it’s clear. But for lesser mortals, let’s work through some possibilities as an exercise. For me, that color leg brings to my mind two main possibilities since this leg is fairly large: loon and goose. What other traits would we expect were this a loon? First, the skin-bearing tarsometatarsus is extensively flattened side to side, giving it an almost blade like appearance head-on. Bird C looks to have a rounder leg that that. The toes are no help since they aren’t here, but we can use the proportions of the leg bones as well as a bit of knee anatomy. Leg anatomy of loons. Note the proportionately short femur (f) and the pointed projection at the knee joint. Click the image for more pics and a bit of video! When you watch a loon in the water, it makes perfect sense. Legs set as far back as possible on the body works in the water the same way an outboard motor works on a boat: you want that propulsion system at the back of the craft. Unless you are like me and my hapless fisherman father when we tried (once) to use a trolling motor. We mounted it on the side of the boat and proceeded to describe large circles on the lake for an hour or so before giving up. In the images of loons underwater, one cannot even see where the short little femur is on the body because it is snugged up under the thick feathers. The reason that femur is so short comes to down to a clever bit of physics. Though the femur is short, it is overlain by thick bands of quadriceps muscles. These are so beefy, they need extra attachment points where they insert at the knee. That reinforced structure is the spear-like projection, called the cnemial process, that juts up from the knee in the image of the hind limb bones. Muscle can attach along that whole length. When those strong muscles contract, though they are short, they pull on that cnemial process lever arm, and for a relatively small contraction distance, the tibiotarsus makes a very wide arc. That’s the kick you see in the video of the swimming loon. You notice that the loon keeps its wings tucked in tight while swimming. This is in stark comparison with a wing-propelled diver like the Thick-billed Murre. These birds are a bit awkward in the air, seeming to be just on the brink of crashing. Their flight is labored, with their heavy bodies and proportionately small wings. But, as with the loons, all forms of locomotion are evolutionary trade-offs with others. In this video clip of murres underwater, you can see their short, pointed, stiff wings are just the thing for swimming. Note that their legs, on the other hand, just trail behind them, as they would during flight in the air. Their hind limb anatomy resembles a land bird much more than a loon since they did not evolve to use their legs and feet for swimming. 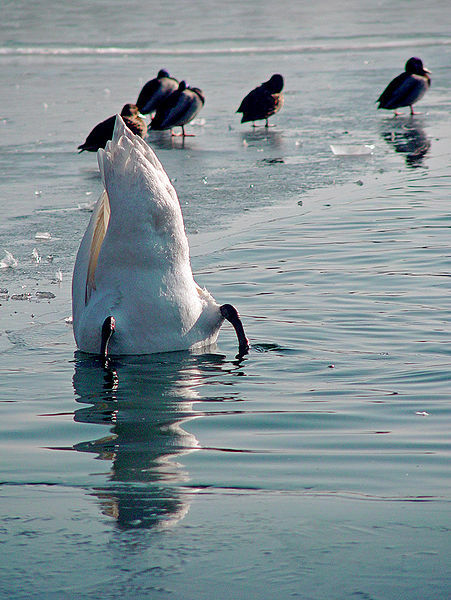 In dabblers like this swan, as well as geese and the non-diving ducks, the birds are limited to the aquatic food they can reach from this absurd upturned position. The feet and legs do little more than help a bit with balance and orientation. A long neck helps with this, but it also helps to feed on immobile prey like plants. To catch more active foods, the ability to pursue is a major benefit. Bird C–large sized, black legged, likely not a diver–seems too big to be a Brant, but too small to be a swan. The consensus on this one is Canada Goose, which is fitting given how many of them we’ve had reported this spring as the ice melts. Now, my friends, I am off to learn about forest ecology and land management for several days, blissfully without internet. I’ll see you here when I get back! This quiz didn’t throw our regulars off much at all, which is no surprise since they are a crack team. 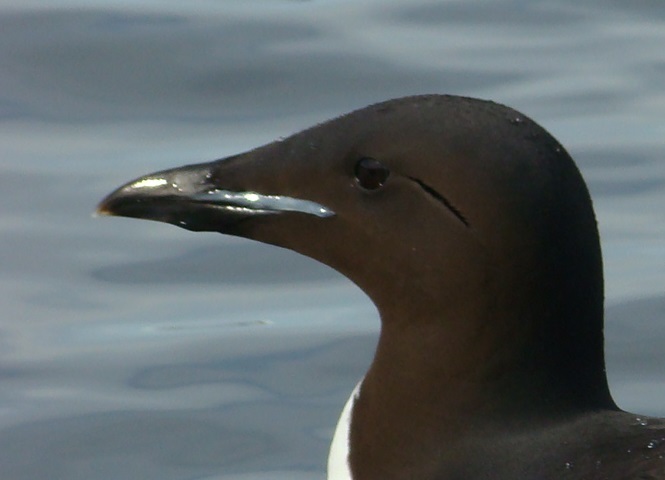 I agree with all three of our respondents, who all identified this as a Thick-billed Murre (TBMU). We hardly ever get Common Murres on SEANET beaches, but we must remain alert to the possibility. And sometimes, it can be tricky to differentiate the two. 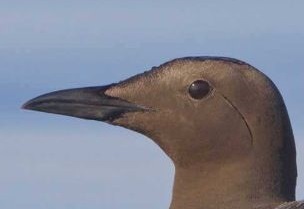 The northeast SEANET Field Guide uses measurements as the decisive factor, noting that, in the Common Murre, “bill depth at gonys <1/3 culmen.” The gonys is the point on the lower bill, which is particularly conspicuous in the Thick-billed. Living up to its name, the TBMU has a greater depth at this point. Overall, the bill looks different as well, having a much straighter appearance in the Common Murre. The feature I find particularly useful is the presence or absence of a light gape line running straight back from the corner of the mouth in TBMU. It is not present at all times or all ages, so its absence is not decisive, but its presence definitely indicates TBMU. From these images, it appears that the bill on a TBMU is considerably shorter than that of a COMU. In fact, this can indeed be a useful factor when available. COMU culmen is reported in the range of 39-46 mm, while TBMU range from 30-38 mm. For Bird B, where we have another beak in closeup, we have to first consider that the feathers at the base of the bill are partially missing and the remainder are matted down. This is common in birds that have been decomposing in the water, where feather and skin slip begin happening soon after death. It also makes it difficult to pick up on the feathering pattern in that area. Thus, we must go solely on the shape of the bill. The chisel-like shape, with the weight of the upper and lower bill appearing similar is reminiscent of a loon. But this appears too short, even for a Red-throated. That leaves us with the cousins of the loons, the grebes, and with something we might offer as an alternative hypothesis, an American Coot. 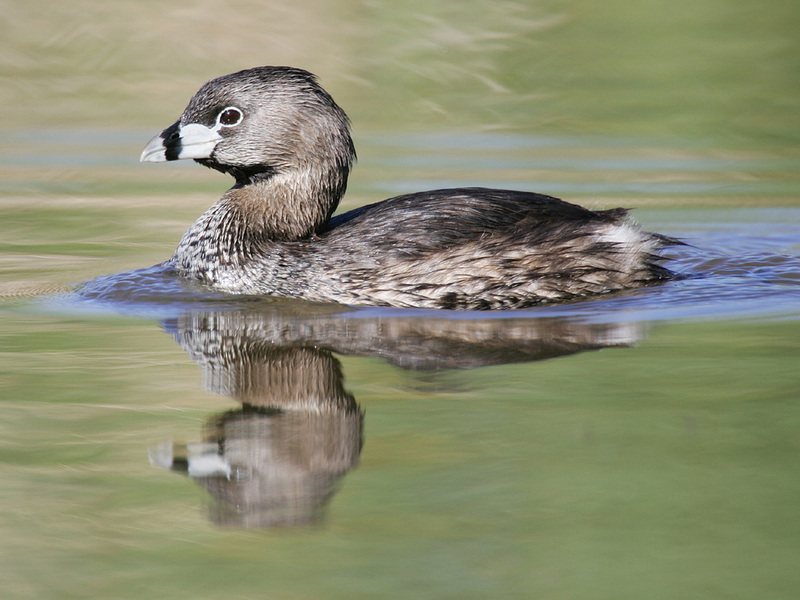 For prospects among the grebes, we have the Pied-billed, Horned, and Red-necked. When looking at our Bird B, we have both the color and the shape of the bill to go on. However, in dead birds, we must always remember that color can fade and shift with time, so if color and shape seem not to agree, best to defer to shape. And in this case, we have a very pale bill, but that may not be a true finding. As for shape, our Bird’s bill doesn’t look as stubby as a Pied-billed, nor as loon-like and spear-looking as a Red-necked. 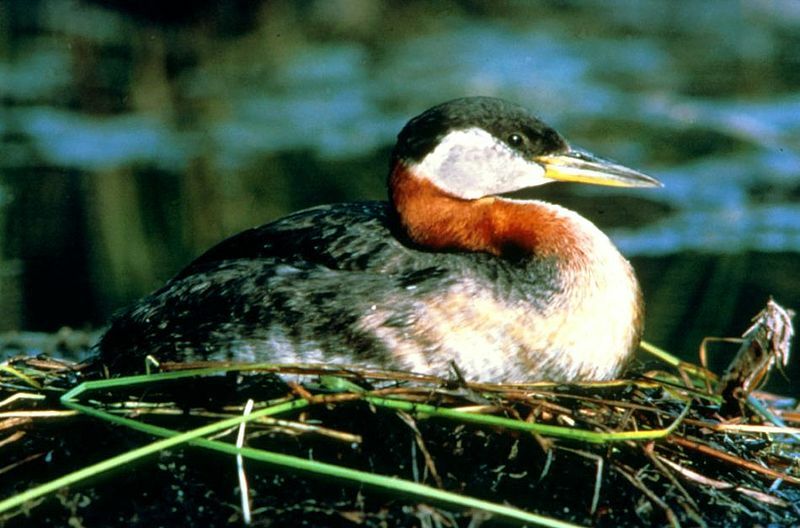 So, how about the mid-range option in grebes, the Horned? Horned Grebes have a dark bill when in breeding plumage, but a lighter gray one in the non-breeding season, as you see in the bird here. In that excellent photo, you can make out the whitish tip to the bill. I can’t claim to see that in our Bird, but, then again, all the color appears fairly well washed out of our bird’s bill. 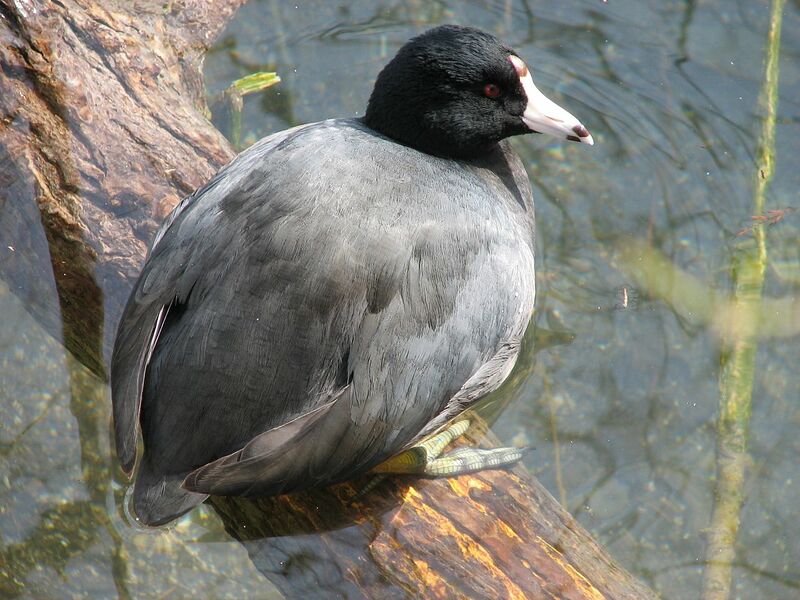 Additionally, a coot or moorhen has more of a droop to the bill tip, unlike our Bird B, which has a quite straight and self-respecting outlook on things. So, we’ve got a TBMU and a HOGR. That still leaves the severed leg, but this post is overlong already and I have not yet had my supper. Next time, the i.d. revealed, and an anatomy lesson on wing versus leg propelled divers. Until next time, Seanetters.